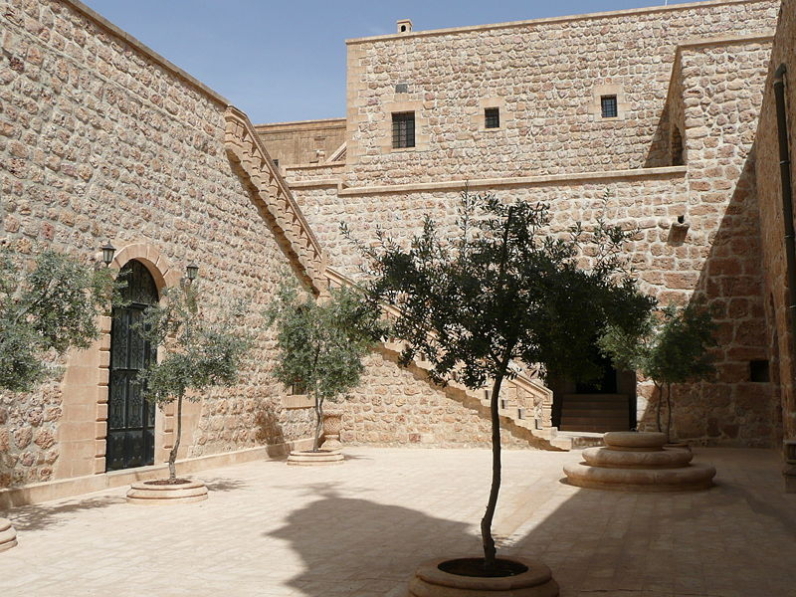 Editor's note: Facing massive criticism and intense scrutiny from European officials, the Turkish court in Mardin canceled the trial against the Saint Gabriel monastery scheduled for Christmas Eve and dismissed most charges that were to be adjudicated on that day, including the two main charges that the monastery was established illegally and its activities are violating Turkish law. The court scheduled trials for January 16, to address the issue of a wall the monastery built, and February 11, to determine if 270 hectares that were confiscated by the government belong to the monastery. (AINA 12-24-2008). (AINA) -- Surrounded by fields of melon, olive groves and pistachio trees, lies one of the world's oldest buildings. It is a magnificent house, more like a castle, built by pink stone blocks. It lies in Turabdin, the mountain of God's servant, more exactly in northern Bethnahrin, which is called Mesopotamia, in what is now southeastern Turkey. Many say that civilization was born here 5,000 years ago, and that Christianity later on also originated here. The monastery of Mother Gabriel (Saint Gabriel) has been standing here for 1,600 years, it is dated to 397 A.D. Here the language of Jesus is spoken and taught, the language whose modern variant I speak every day. The monastery, which is also a historical museum, is filled with spirit and love. An archbishop and several monks and nuns live within its walls. It is also home and school to around thirty poor children from nearby villages. The life of the monastery is pretty monotonous and, if it hadn't been for the of thousands of tourists that visit every year, peaceful. It's not only the tourists that "disturb" the peace, however. "The red sand" that makes up the land of the monastery is controversial. It is reddish and fairly soft but it also symbolizes human blood, Christian human blood. In the city of Midyat there was once seven churches that were all governed by the Archbishop of the monastery. In the surrounding villages there were even more churches. Most of which are now closed. At the same time the number of mosques in Midyat has grown from one to four, and they're big. The members of the church has moved to cities like Södertälje in Sweden and Augsburg in Germany. Turkey is almost emptied of Assyrians, who are also called Syriacs and Chaldeans. The monastery is one of the last bastions of the original people of Mesopotamia. Just before Christmas of 2008, Mor Gabriel was threatened by Muslim village bailiffs. Assyrians worldwide reacted strongly. In Södertälje five thousand people demonstrated their concern. The threat came to the publics knowledge when a suit against the monastery became public. It was signed by three Muslims from one of the monastery's neighboring villages who think that the police should stop the anti-state activities of the monastery. The suit stated ten charges, each more ridiculous than the other. It was one sentence in particular that made five thousand people defy the winter cold in Södertälje on December 14. It said: "Fatih Sultan has said that you should cut the throat of people that break a branch from one of his trees". They threatened to kill non-Muslims, in the same way as in Iraq. On December 18 a Swedish delegation comprised by among others several parliamentarians went to Turkey to investigate the threats against the monastery. They wanted to know how come Turkey could allow that the seventy defenseless inhabitants of the monastery were threatened with death by Islamists. I went along. Day one turned out to be intensive and emotional. The delegation was watched and protected by the Turkish intelligence service. And the meetings during the day were very intense. When we met the governor, the highest ranking civil servant in the area, I requested that he read the charges out loud. When he had finished reading I asked about his personal opinion. At first he laughed, but he then became infuriated and said that they were filled with lies and outrageous claims. The district governor said the same thing. "Everyone, the Syriac Orthodox Church as well as the Turkish state, knows that the wall was built to protect the people living inside the monastery. And there is nothing ridiculous about us wanting to supervise the trial." Helena Storm, who is the First Secretary at the Swedish embassy in Ankara, had been given the mandate to represent the EU. She made it clear from the outset to the governors and the attorney, that the EU will follow every step of the judicial process against the monastery. Sweden is the EU's strongest propagator for Turkey to become part of the EU, "something we've been criticized for," said Storm, and continued: "A threat like the one against the monastery does not exactly better the situation for Turkey when it comes to the EU." It was a confusing first day. A lot was said. Much was empty talk. New decisions were taken. Decisions that were rolled back. But in the end, the three villagers' charges against the monastery were gone with the wind, as if they'd never existed. The trial regarding the wall was held the following day. We were about twenty people who were allowed to attend. The negotiations took a little bit more than ten minutes. The only thing dealt with was when the next negotiations should take place. Outside the court room a Turkish journalist asked what I thought about the two hundred Turkish intellectuals that had started an online roll-call to highlight the genocide on Christians during WWI. I let my emotions take over when I answered that that was the least that they could do. Emotions also dominated the interviews that took place outside the court room with the village bailiffs and the representatives of the monastery. On December 20, after the delegation had returned to Sweden, photographer Linda Asmar, an assistant, a driver and I went to the village of Yayvantepe. The village bailiff and five other men agreed to talk. We sat down on the floor in a large room in one of the houses in the village when she slowly opened the door. She looked at the people assembled until her eyes stopped on Linda Asmar, the only woman in the room. She took a few careful steps in to the room. Suddenly the older men started screaming and interrupting each other. The girl got nervous and moved towards the wall until she stood leaning against it. When things had calmed down a bit she took the last steps to Linda, and turned towards me and smiled. With her almond shaped blue eyes she was incredibly cute. I was just about to ask what her name was when things turned wild again. Luckily it was a sunny day, otherwise we would have been freezing. The heaters were turned off. The leader of the village, the bailiff, is called Mukhtar, and he didn't allow the electricity to be turned on -- it would cost too much. When the battery of my computer had almost run out I finally convinced them to turn on the power. That also enabled the women to use the stove again, Linda said afterwards. Media had described the village bailiff and his closest men as fundamentalists, as crazy Islamists, and I wanted to investigate how fanatical they really were. Several dailies had written that the villagers had threatened to destroy one of Christianity's most holy places. I asked if that was true. "They're lying. It's the bishop and his people that are spreading false rumors. They are the ones that have raped our land and they should be confronted with it. And we should not have to be confronted with false rumors," Ismail Cagligan, one of the oldest shepherds of the village, shouted. He was upset. Mukhtar Ismail Erkal put up his hand and shouted back: "Shut up. You have to express yourself more graciously!" Bushra, the girl with the blue eyes, carefully took Linda's hand and led her out. They were to go outside and socialize with other women. I and the other men continued to shout for a couple of hours. "The bishop will have to share. The monastery doesn't need all that land, they should give up part of it. There are more of us Muslims, right?" said the man that poured us tea in the traditional small oval glasses. I showed them the document with the threatening charges and asked if someone could call the three men who had signed it. Mukhtar did a few phone calls. The signatories did not want to talk to me. "But do you know what it says here in the suit," I asked. "No, we can not read nor write," the seven men answered almost in unison. They looked at each other, embarrassed. "Those who signed the suit, can they write?" It turned out that they also couldn't write. So the question remained: Who had written it? And why had the three villagers signed it? In the beginning, Mukhtar didn't know who had written it. After I had insisted and asked several times the answer became that it was a government lawyer. When I asked what his name was the answer became different. Suddenly it was a lawyer that Mukhtar and the others had met on the street. His name was not remembered, nor what he looked like. Mukhtar and the others claimed that they didn't know what the suit against the monastery said. I read the ten claims for them, one by one. For example the one about the monastery carrying out anti-state activities. Everyone answered that, well, that was correct, the monastery did busy itself with anti-state activities. The nature of these activities they couldn't define, however. It was the same story when it came to the other claims. "The governor thinks that you are a bunch of backwards village fools, what do you think about that," I was urged to ask. "He's right, the governor's right. We are a bunch of fools, otherwise we wouldn't have let ourselves be used in this way," one of them reacted. "What do you mean that you were used? Who has used you?" I pushed. They looked at the floor and continued sipping their tea. Nobody answered. Apparently, their opinion was that I had to figure that out myself. But at the same time they made clear that the words of Fatih Sultan were valid, and that they were prepared to chop the head of someone that destroyed Muslim land, at least symbolically. Linda Asmar, our driver, our assistant and I, left the village with many questions, but also with some answers. "Even if the AKP-parliamentarian claims that the Assyrians had emigrated because they wanted to, all historical facts point to the opposite. Assyrians in Midyat and the surroundings were killed in 1915, and those who survived fled. There are many other reasons that the number of Assyrians have been decimated. In the 50s and 60s they were persecuted for strictly racial reasons. In 1974 and 1975 they were persecuted and oppressed because of the Cyprus crisis. The military coup in 1980 also hit the Assyrians very hard. During the armed conflict between the military and the villagers in the 90s many, of the few that were still left, fled. While there was a state of emergency over fifty Assyrians were killed in Midyat and no one has been arrested for any of the murders. The assailants are still unknown. In the 21st century Hizbollah's threat against non-Muslims has pushed everyone that has the means to leave the country." During my lifetime, a bit more than forty years, intellectual Turks have fought to take down the feudal system; now it is back. Maybe more profound than ever before in modern time. AKP chooses representatives among big families and powerful tribes, so that these individuals will gather many votes in favor of the AKP. Granted, there are free elections and thus a sort of democracy. But it is also to go back in time, and Turkey risks becoming a country where uneducated farmers once again find themselves used by more educated leaders. Two trials remain against the monastery of Mother Gabriel. One will deal with whether the wall that has been built to protect the monastery's inhabitants is illegal. In the other trial the monastery has sued the state for having confiscated 270 hectares inside the walls. There is no doubt that the wall is needed. It is strange that the Land Surveying Office claims that 270 hectares will belong to the state and no one else because it consists of "wild forests and unused land". Is it perhaps in reality about the power exercise of feudal lords? The monastery has paid taxes for precisely that land since 1937. In addition Mother Gabriel has been heated by wood from the little piece of land that is inhabited by forest -- so it is hardly unused. On my way home to Sweden I visited another historical monastery, Deyr ul-Zahfaran. There I met a small Christian girl. Her name is Mahbuba and she has almond shaped brown eyes. She was with her family that had just escaped Islamic persecution in Mosul in Northern Iraq. They sought protection and housing in the monastery. A Muslim friend from my childhood, that wants to remain anonymous, drove me to the airport. He's born on the same street as me in Midyat. His father and mother are friends of mine. On the radio we hear that the governor Mehmet Kiliclar, whom the delegation met, had been replaced. My friend is convinced that it is because of the monastery trials. I showed my friend a picture of the Muslim girl Bushra and the Christian Mahbuba. Two small cute innocent girls whose experiences may end up making them enemies. Translated from Swedish by Christopher Holmbäck. Click here for pictures of the St. Gabriel monastery. Nuri Kino is a journalist in Sweden specializing in investigative journalism, and is one of the most highly awarded journalists in Europe (CV). He is an Assyrian from Turkey. His documentary, Assyriska: a National team without a Nation, was awarded The Golden Palm at the 2006 Beverly Hills Film festival.